Hey! You there! Have you ever seen something that wasn't there? I mean, really wasn't there? Have you gotten the chills and just felt there was something going on or there was someone else there? This happens to me all the time. I, you see, am a professional psychic. I use my clairvoyance, or psychic sight, regularly to do readings for people all over the world. You, too, can learn to develop your psychic vision, whether you've already discovered this gift or are brand new to it. By simply using your imagination, visualizing, and playing with symbols, you will be well on your way! Psychic vision is the ability to see beyond your normal physical sight using extrasensory perception to see internally with your third or psychic eye. It is the gift of perceiving objects, places, or people distant from you in time and space. And, though both processes work, there are two distinct ways to accomplish this. Clairvoyance is the metaphysical method of psyhic vision—the natural one, if you will. It's the one you've been born with or the one that gives you goosebumps. It's the sense you probably doubted was real at some point, if not now, and attributed to your imagination. Clairvoyance makes you say, "What was that?" Coordinate Remote Viewing is the other method. It's the one the United States Government decided to invest millions of dollars in to prove or disprove that those clairvoyant flashes or knowings you are receiving are real. And, so, in order not to be left behind by any other country that was already doing it, they created a program, in conjunction with physicists from the Stanford Research Institute and the US Military) to help any layperson learn to do what psychics have been doing since the beginning of time. And, they put together a very strict protocol in order to accomplish this. Which, yes, works! And, works well! You have a choice and can pick which way you'd prefer to cultivate your own personal talents. Luckily for you, you can also choose both! Clairvoyance is a metaphysical term that means being able to tune into your intuition or your psychic abilities to view things or receive messages from the other side. These messages are communications from your deceased loved ones, your spirit guides, and your angels. They can be in response to a question you've asked, or simply a sign of love to let you know your friends and relatives are still around. Often, you may receive a psychic vision to nudge you towards someone or something or even direct you away from it. But, clairvoyance is not the only way to "see" psychically. Just as we use our physical senses to help us fully understand things, we also have other intuitive gifts that allow us to more fully comprehend the messages we are receiving. Some of us even utilize these senses more often than clairvoyance. The other basic senses are clairaudience (clear hearing), clairsentience (clear feeling), and claircognizance (clear knowing). Think of it this way: imagine clairvoyance is your quarterback on your champion football team. The quarterback can't do it alone; he needs to work with his teammates so they have stronger and more positive effect on the field. After all, you can't score a touchdown with just one player. In order to win you need to play well together. It's the same with your psychic vision; there are helpers in place to give you a broader perspective, a better psychic vision. Coordinate remote viewing, or CRV, is the ability to see things distant in time and space and to gather intelligence from them. This program was developed in the 1960s, and through extensive trials and scientific research has proven its merit. We were not the first to admit we had developed a psychic spy program; after the Soviet Union's declaration of such a program, the United States admitted to the American public that we had created this controversial protocol. This was in the 1990s; the details were glossed over, and since that time the program is rarely spoken of. Even so, it did open the door for the private and public sector to discover all of the details of the original program along with the benefits. I enjoy having a scientific basis to connect to energy distant from myself. CRV affords everyone the opportunity to remotely view. Just like with psychic abilities, it doesn't mean that everyone will be a star at it. After all, everyone can hit a key on a piano but not everyone will be Beethoven. However, we can all learn how to use it and develop our natural gifts. 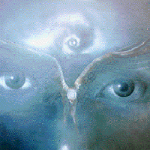 Awakening your psychic vision can open your eyes, both sets, to a whole new world. There is much to discover when you remove the physical limitations and allow yourself to take a deeper look. Recognizing that you are using your clairvoyance or remote viewing is the first step to growth. Sometimes, though, it can feel like your imagination, which changes the way you feel about psychic ability. So, what can you do about it? Below are three ways to practice your psychic vision. Close your eyes. Imagine standing in the middle of a food store; it can be a large chain store or a small mom and pop grocery. Now, look around you. Look at the shelving. Notice what color and how many shelves there are. Then, look at the products on the shelves. Pay attention to the different colors, shapes, and sizes you see. Allow your mind's eye to take in any artwork on the goods that are in front of you. Take advantage of all of your intuitive senses and decide how the groceries on these particular shelves make you feel. Do you feel hungry? Do you want to clean? Do they make you think of your pets? Or of washing yourself? Take one last look, in your mind, and pick up on any details you may have missed.Now, open your eyes. Were you able to see anything? Do you know what store you were in? Could you tell what color the shelves were? Or how many shelves there were? What colors did you see on the shelves? Could you make out what the groceries were? Were there cleaning supplies? Or bags of bread? Or Pet food? What was there? Did other details help you to make out what it was you were seeing? Now that you've imagined it, you can go a step further and use your psychic vision to see into the future! Before you walk into a grocery store the next time, you are going to intuit what you will see on the shelves. Asking yourself the same questions as above, tune into the middle aisle.What do you see in your mind? What do you actually see when you physically walk down the aisle and look at the shelves? Does it match up at all? Did you intuit the actual products or just the colors or shapes? Try it in the next aisle. What did you get? Did it match what was physically there? If you found this to be a difficult exercise, keep trying it! It will get easier with practice. If the hardest part was using your imagination, that is where you should focus. If it was harder to actually tune in to your intuition and see what would be there, then continue developing your gifts! You may find that you actually get really good at it. This may be your Beethoven moment! You might discover your clairvoyant skills are already up to par, but how good are you at remote viewing? Remember, true CRV means you must follow specific protocol. But, that doesn't mean you can't do a less precise version. Are you ready to try? Choose an address in your town or the next one over. Make it a random address, one you've never been to and wouldn't recognize. Be sure it's an actual location, however, or you will just be spinning your wheels! Tune into that address; just keep focusing on the location. Then, begin by allowing descriptive words to flow through your mind. For example, colors would be descriptive. Or even temperatures or textiles. What words describe the sensory impressions there? These include sounds, sights, scents, tastes, and even tactile impressions. Now, it's time for a road trip; that's right—you are going out! You need to go explore what you received. Don't get arrested for trespassing, but visit the address and really take in whatever you can from the curb. Does it match any of the sensory impressions you were receiving? If so, awesome! You are well on your way to using your gifts! Does it not match anything? That's okay, too! Remember, you are not looking inside, so there are many other sensory descriptions that you may not be able to see. Try it again. Pick a different address. This time focus solely on what the physical eye can see from the road. Did this work better? Was it easier? Was it harder? Regardless of how well you did, pat yourself on the back. You deserve congratulations for your (possibly) first CRV session. "I need a sign! Am I doing the right thing?" How many times have you said this? Or, at the very least, heard this? Probably quite often. The reason is because we all want to be guided into the right direction. We want some help in our decision making, and at times we would love to have the decision made for us. This is one of the areas where psychic vision can help.Signs and symbols are those messages from the other side that are sent to help direct us and keep us on the right course. While signs are messages you can see externally, symbols are messages you receive internally, or with your psychic vision. So, what better way to understand what symbols are than to use them? You've already used your imagination to tune into your psychic vision. It's time to allow that imagination to help you create your symbols! A symbol can represent a message from the other side. It's something you see with your third eye, or your intuitive sight, internally, in your mind. Symbols can be used to answer questions or to address concerns. Imagine a traffic light. There are usually three circles of color: red, yellow, and green. Now think for a moment what each color means. Generally, red means stop, yellow is telling you proceed with caution, and green is saying go, full speed ahead! So, if you are looking at a traffic light and you see the red is lit up, it is telling you that you are not supposed to continue on. It works the same symbolically. Decide on a question where the answer will be one of three things: to do something, to cautiously consider the options first, or to not do it at all. Ask yourself the questions internally. And visualize your street light. Do you see the colors? What color did you see light up? Does it make sense? Did it help you make a decision about whether or not to proceed? Was it the color you expected? Ask another question. Are you going with your symbolic answer by psychically seeing the traffic light? You can actually have a little more fun with this by having a friend ask you a question. Let them know what color you see and what it means for them. You’ve done it! You've worked with your psychic abilities in three different ways. It's okay if you haven't mastered them all—it's fun to practice, and practice often. As with anything you can become good at, developing your psychic vision is one gift that can keep on giving. Above all, with all of the exercises, it's about learning to tune in and have fun while you do. If it's not enjoyable, you won't want to continue trying, and that may leave you with some unopened gifts. Psychic vision is not a gimmick, and it's not something only attainable by a select few. Everyone can learn to use their gifts. It's up to you how much or how little you employ them. You have seen the light! Article originally published in The Llewellyn Journal. Copyright Llewellyn Worldwide, 2015. All rights reserved.